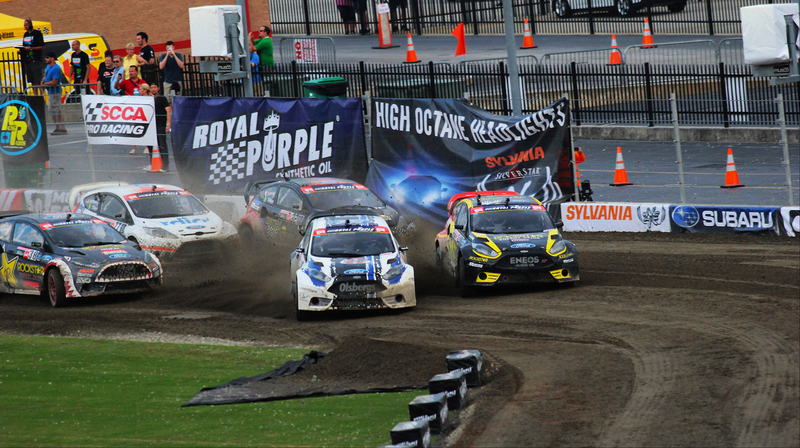 Atlanta, Ga., August 10, 2013 – Finland’s Toomas Heikkinen continues to be untouchable in the 2013 Global RallyCross Championship, as he runs out front unchallenged in his Bluebeam OlsbergsMSE Ford Fiesta ST for the entire final. Toomas has now unofficially clinched the 2013 Drivers Championship, which we expect will be made official at Charlotte in September thus capping off a fantastic year for Heikkinen and Ford Racing. Heikkinen who had cruised to victory in his heat race earlier in the day lined out on the front row for the final where he was flanked by fellow Fiesta drivers Ken Block to his right and Tanner Foust to his left. With the track configuration for Atlanta, it seemed that the middle lane was working best for most in the heat races in an effort to avoid the first turn shenanigans, as always Heikkinen made good use of his lane choice. Foust and Heikkinen launched hard off the line and were neck to neck heading into the first right hander and onto the gravel section, once again Topi would shine taking the perfect line and gaining the advantage on Foust. Foust and Heikkinen would come together again going though the first left hander, but again the Finn would prevail and maintain the lead. Although there are few that can question the speed and ability of Ken Block on the Global RallyCross tracks, Ken himself can’t seem to get the monkey off his back when it comes to the finals. Ken set fastest times in both qualifying sessions, and posted second fastest to Heikkinen in qualifying, after recovering from a spectacular roll I might add. Ken’s lack of luck in the final continued, Block would stall on the starting line, Ken would eventually get the Hoonigan Racing RX43 Fiesta going but he retired shortly thereafter. Although Ken has yet to take an outright victory in the GRC, he has medaled at XGames Munich and has also made the podium in Bristol. Back to the front and it was all Heikkinen, chased by Foust then Brian Deegan, both Heikkinen and Foust opted to get the joker out of the way on the first lap, while Deegan took the long way around. 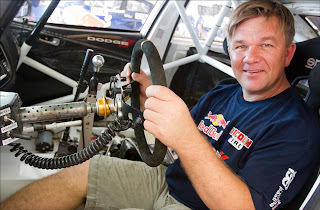 From there it was Déjà vu as Heikkinen sailed off the front, although Foust keep pushing and closed the gap on a few occasions, he never at any time had Heikkinen on the ropes and under pressure. Heikkinen, Foust, Deegan, Speed and Sandell are all run out of the OlsbergsMSE shop in California. One would assume that all the Ford Fiesta ST’s are equal, but if I recall correctly, Marcus Grönholm’s Fiesta always seemed to have a little more than the rest last year. Again not to taking anything from Topi, but his car seems to have that extra little sprinkling of fairy dust, Topi was able to pull away from Tanner with ease on the front straight, and why not, Heikkinen is after all the official OlsbergsMSE team driver. Subaru who had seen more downs than ups in Global RallyCross in 2013, have finally found their “a” game, the cars are much quicker than in prior events and the drivers are embracing the change. Dave Mirra, who has qualified for his first GRC final in 2013, was all over Brian Deegan in his heat race, and won the LCQ with a last lap pass. Mirra was taking names on the first lap of the final until he was barged off the track by Scott Speed while sitting in fourth place, thus ending what could have been a podium finish. Speed was issued a black flag for his actions while Mirra slid though the grass to scramble back onto the track. Dave Mirra’s teammate Sverre Isachsen would overhaul Scott Speed for forth before the end of the second lap. Brian Deegan who had been running strongly in third place, pulled to the side of the track on lap 6 with engine problems, therefore conceding third to the Subaru’s Isachsen. Off the front it was business as usual for the young Finn Heikkinen, who has taking the Global RallyCross scene by storm in 2013. Tanner Foust, who had little or no answer for the speed of Hekkinen, would get a left front puncture on the closing laps; Foust had to turn his attention to protecting his position from the hard charging Sverre Isachsen who was closing the gap for second. It really hard to take anything away from Tomas Hekkinen, his dominance over the rest of the field in the Global RallyCross has been remarkable. Yes he has had a lot of luck in the first turn, but I have so say his lines are razor sharp and he stays committed no matter what’s going on around him. The runner-up finish was the second straight for Foust in the Rockstar Energy OlsbergsMSE Ford Fiesta ST and third podium appearance this season. “This track was really a difficult track and it once again came down to how you did on the start and avoiding collisions in the first corner,” said Foust, “Second never feels great, but I am glad to be on the podium again. I for one had some high hopes for the Pastrana/ Dodge Team coming into Atlanta, the team has been going through many of the challenges with the car that like Subaru had been experiencing, were looking for a turnaround at Atlanta. They had called on the services of WRC driver Henning Solberg to team up with Russia RX Champion Timur Timerzyanov to fill in for Pastrana and Bryce Menzies who both had conflicting commitments this weekend. Unfortunately the cars was not on the same plan, booth Solberg’s and Timerzyanov cars gave trouble throughout the day, yielding yet another disastrous outing for the Dodge camp.